“When I walk by those awkward, little slopes along a home’s sidewalk I can't help but think about how wonderful it would look with an outcropping boulder wall with landscape pockets. This type of wall really finishes off a front yard, because it looks intentional, but not overly done,” Natalie Selker confesses. 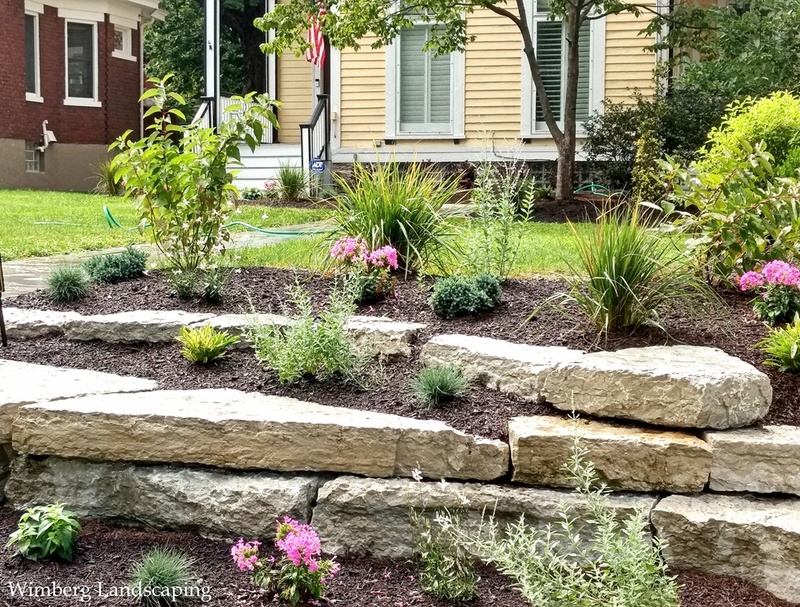 “Leveling the yard and finishing it with a stone wall, and room for plants at the base along the sidewalk is a great option. But, when your client is a gardener and is asking for more room to add plants, this type of “planting wall” is the perfect solution,” Selker shares. Large stones or outcropping boulders are staggered and set apart to create planting pockets of all sizes. The size of the stones and planting space is determined in part by the size of the yard- it’s depth as well as it’s sidewalk footage. “We want to keep everything in proportion with the rest of the yard and the home,” Selker explains. In most of the landscapes Selker designs, squared off stones are a better fit than the tumbled boulders. “I like how the edges of the cut stones makes for a tidier look and it’s easier to keep soil and mulch in place. It also matches when a wall is adjoining another linear form, like a sidewalk.” Selker explains. To successfully finish an outcropping planting wall, equal attention is given to plant selection. A mixture of annuals, perennials and, if space permits, small shrubs ensures the garden wall will enhance the landscape year-round. If your landscape would benefit from a new wall, with room to plant, call us today to schedule an appointment.